We are in Kindergarden countdown around here. I have become school obsessed. I wanted to make something fun for myself, since I'm getting ready to start a new class too! Sl st in next stitch. Fasten off. Leave the Eraser and Wood ends, but weave in any other loose ends. The tube is going to be very long and skinny. It isn't easy to slide the pen into it, but I'm going to quote Julia Child here and say, "You just have to have the courage of your conviction" and shove it in. I promise, it will fit, and if we made it bigger it would be too loose and wouldn't stay on. Once you've got the cover on your pen, use your tapestry needle and the loose ends to really snug the cover onto the pen as you wind the ends in. Thank you, thank you, thank you. I'll select the winner next Friday, September 7th. 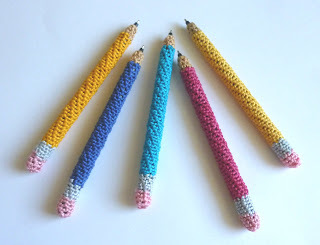 I think you should use etsy...and I would love a purple pen/pencil cover! Hi Nikola! Of course I would ship to Germany if you win! Thank you! I would say to try etsy, I'm on there all the time and your stuff is just as good (if not better) then alot of the items I see. Another option would be to donate items to your local church/Hospital/School (for their Christmas bazzars. btw, after the pen runs out can the cover be removed to use on a new pen? No, the pen covers can't be removed. But the black plastic tip of the pen that sticks out can be removed with pliers and replaced. Which is even better because it's no-sew! I think an Etsy shop would be a good idea. I have one to sell my hats on. I love to make them, and I don't want to wear all of them, so selling them is a good thing! I think you should give the Etsy store a try. Why not? I think your work is awesome and I believe you would do well selling your "left-overs" on etsy or anywhere else. 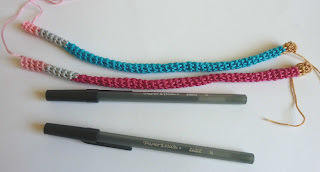 Someone mentioned using them for charitable contributions and that is not a bad idea either but when you make a sale you know that someone really wanted the item and not just because it was free :) Speaking of free, I would love to have either a pink or blue pencil-pen (big grin) I love your work! By Donating to a Church/Hospital/School, yes THEY are getting the items for free, but they will in turn sell those items at their bazzars. So in the end someone who really wants that item is buying it, and you are helping whoever you donated it to raise money for their good causes. I don't really know what the etsy store is or entails yet there are people looking for original handmade objects to buy and offer (the christmas gift season is coming back) and why not try makng some cash if you can. Some other items you can donate to charities but whatever you do I'm sure you will make some people happy. I guess, all I'm trying to say, is: try it out if you think you have the time on top of everything else you're doing - b/c, hey, it's $$, and who doesn't need that! But, $$ isn't *everything*, and you can always change your mind, so stop if it turns out to be not going the way you want. good luck deciding, either way. Hi Jamie! At the Joann's I go to the embroidery floss is all on sale this weekend for their big Labor Day sales, so now is a great time to pick some up! ...and save 10 cents a skein... LOL!!! Hi Nancy! I laughed so hard at that last line I had to wipe away tears! Thank you!!! Thank you to everyone who has left a comment so far! You've all been entered in the giveaway! I really appreciate all of the different ideas and points of view. I love the spirit of entrepreneurship AND of charity that you guys are bringing. Wow, what a cool (and SPECIAL!!!) group of people you are!!! Keep the ideas coming, Dynamos! I think you should sell from your blog using paypal and cut out the middle man, lol!! I love the new pattern, this is too creative and looks awesome! Definitely unique. Hi Piper! I'm seriously thinking about using a paypal cart on the site, but my only concern is that most people visiting are looking for free patterns to make things themselves. I don't know how to reach a 'I'd rather buy handmade than make it myself' clientele and also make the DIY Dynamos happy. I don't feel confident in my business skills... LOL!! If I would win I would love one in lavender since I use Lavenderladybug...and yes there is a real story behind that name and a real lavender ladybug. Hi Lavender Ladybug! You have peaked my curiosity, and even though I checked your blogs I couldn't find the story of the lavender ladybug! So, please share!! LOL!! I would say give Etsy a try, but you need to do a fair bit of promo work to get it return you want. List them for so ling, then any left over do giveaways/ donations. I don't know where you're based, but depending on what you have you could get involved with something like a shoebox appeal where you fill a shoe box as a present for a kid in a third world country. I think the Samaritans run one, but I'm sure there're others out there too. I would suggest a bartering website like Listia.com, I barter for stuff on there all the time. Just a suggestion. Hi Stephanie! Thanks for the suggestion. I will check Listia out. Sounds like fun! I have been trying to find a fairly quick, yet fun gift for my daughter's preschool teacher and classroom workers (one is male) for the holidays. There are 5 in all! Hi Chaotic Crafting! Awesome! These are PERFECT for that. I plan on making a few for my daughter's teacher, too! Oh, AND... you know how I'm kinda the Qosy Queen? (Think Desk Set of Doom.) I made a little cigarette-case-that-doesn't-look-like-a-cigarette case for a friend at work (yeah, it makes me crazy that she smokes, but I have plenty of my own bad habits). 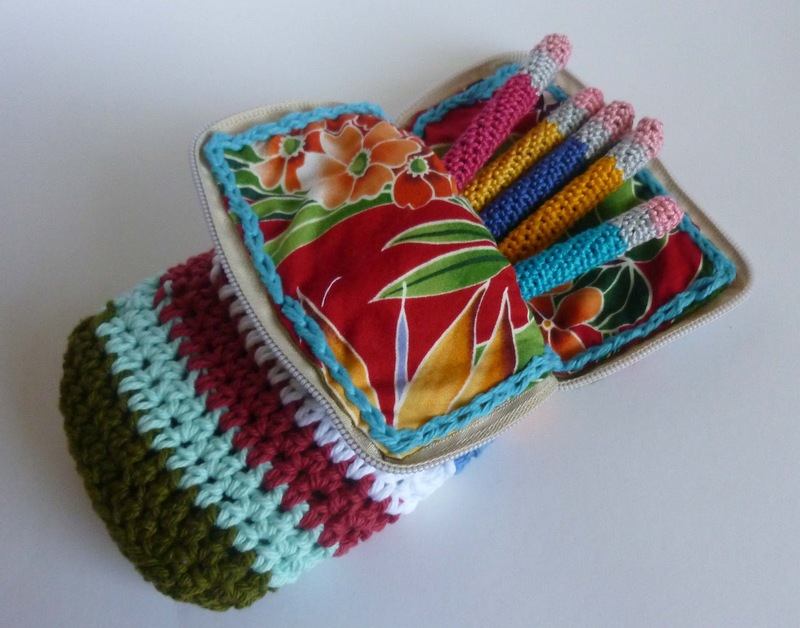 DTF suggested I make individual cigarette cozies and give her the case with the cigs all cozied-out in it. We laughed, I said it wasn't worth coming up with a pattern. Um, mission accomplished. Thanks, J! The Qosy Queen attacks! 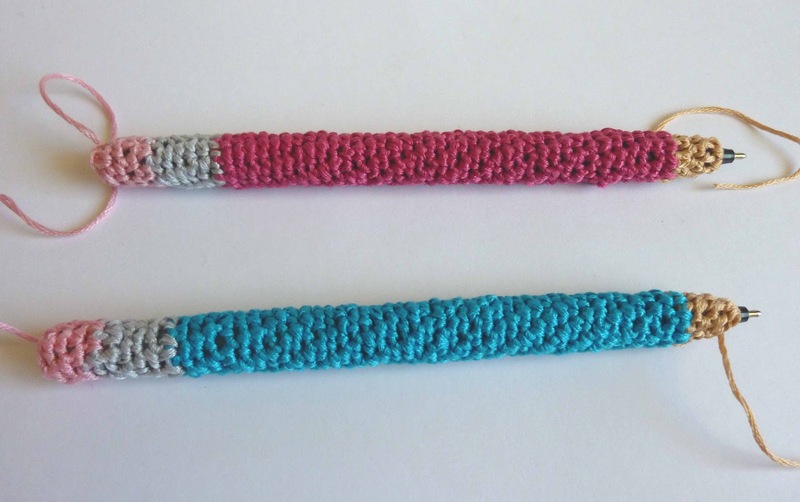 PS I would also suggest you see if the name Crochet Dynamite is available for your Etsy shop name. It would make an easy connection for your current followers. Okay, Loretta, you are a genius! 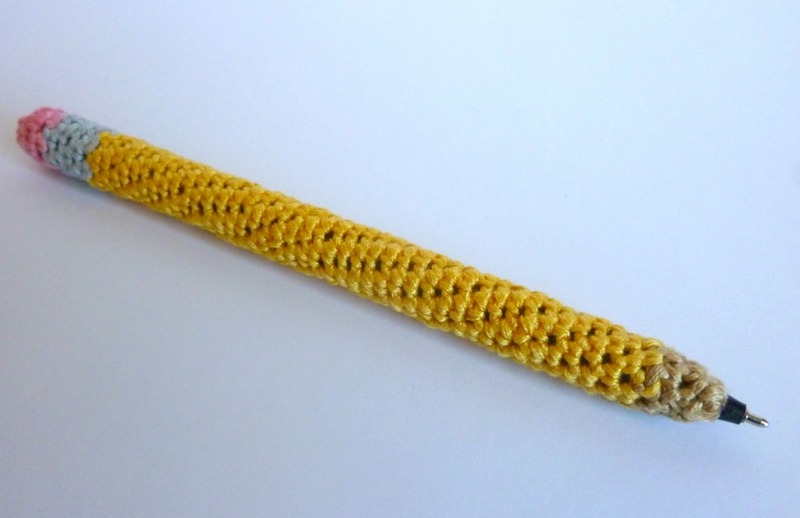 I will have to lock in the Crochet Dynamite name on Etsy soon, because it's not used yet. It would just be silly not to! I love your Etsy site, btw! And you hit me right in a soft spot talking about your elderly aunt. As the full time caregiver for my 91 year old grandma, I have a special place in my heart for people that take special care of the elderly. I will let you know when I get the Crochet Dynamite shop going. I'm not sure what I'm going to do with it yet, but it's going to be fun! Hello, Jaime. I'm not sure if you've already gone on to Etsy, but whether or not you do I have a no-cost recommendation for you. I work for a rather large financial corporation ( I won't name which one, because it really doesn't matter). We have an internal classifieds section on our employee website. All employees are welcome to post items they'd like to sell, share, buy, rent, etc. I've seen everything from homes to costume jewelry. Pictures can be included in the ads, links to other sites, etc. Our Corp Comm department reviews the ads to approve, but then they're posted. Other corporations have the same thing. You probably have several friends in your community (church, school, etc) that work for employers with similar e-classifieds, and it would cost you and them NOTHING to advertise and sell your goods. While I like the recommendation early on from someone who suggested donations to school and church, I'm also a big believer that a worker is worth her wages, and you should not give away your talent at every opportunity. You should consider at least earning enough to cover your expenses, if not a bit more to send you and your family to the local roller rink once a month or so. I love the pens and pencil cases. Put together your favorite color combo, send me a photo with description and pricetag, and I'll post it on my employer's site and let's sell it! I suspect there are dozens of folks I work with that would want to buy - seriously. 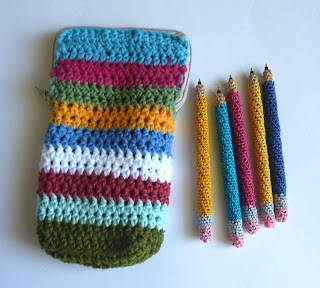 These cases with pencils are ADORABLE and I work with some people who seem to have money to burn - and others who don't but would go without a meal to have something as clever as this! Hi Denise! You are just too sweet! Thank you so much for your offer! I am overwhelmed by your generosity. This is something I've never even heard about before! Holy mackerel! I bet the company that my husband works for has something like this too. I'm going to have to look into this! Go for it! Dream a little, dream big -- just DREAM! These are so adorable! I happened across you blog by accident. You are very creative! Nice. These are so cute. Pinning this for sure! Thanks for sharing the tutorial I will make now. I would say give Etsy a try...on the other hand, what was your goal when you started and what available time do you have? Are you going to be fully vested in filling orders from Etsy? Will you have the time? If so, I would say sell there and on any social media sites you have. If online selling was not your focus/goal, then I'd think about the time needed to do it. You've already got the website/blog, so you do have your base following. Yes, I do think people would be interested in buying what you make. You are so creative and talented. Maybe try putting some on Etsy as a trial run and giving away some. Keep track of your time investment for each. Uploading to Etsy and maintaining the site, filling the orders, going to the post office, etc. vs. putting all in a bag and driving to your local school or church to donate. Or, do you have a farmers market in the area? I do one in my little town. We don't charge anything to be a vendor. We pack the car with a table and a tote or two of items and head up. Great way to meet people and I do sell a few things a week. I consider it more a social with my fellow townspeople. They do keep my inventory moving! Best of luck in which way you decide to go. I know I'm late on posting. What did you decide to do? Anything? If so, let me know how you made out. I've been kicking around the idea of having an Etsy shop too.